TERRE HAUTE, Ind. - Thanks to commuter students at Indiana State University, needy area schoolchildren will have socks to keep their feet warm during the upcoming cold winter months. 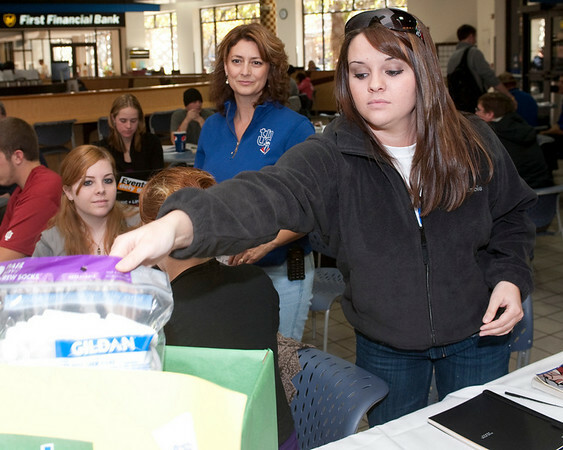 A recent sock drive by Commuter Students Involved: Sycamore or CSI: Sycamore collected 120 pairs of socks. In addition to socks, the students collected $26 in cash donations. All donations will be given to the Terre Haute Women's Club for their annual Shoe Bus Project. Every year, Women's Club sponsors and operates a modified van to deliver nearly 1,200 pairs of new shoes and 2,500 pairs of new socks to Vigo County school age children in need. Children are recommended by school nurses and school staff and receive one pair of shoes and two pairs of socks. This year, the Women's Club is experiencing an increased demand. "The need is so great right now," Laura Thomas, Terre Haute Women's Club, said. "Every little bit helps." The amount raised by CSI will outfit 60 children, Michael Gant, commuter projects coordinator at Indiana State said. Gant said the drive was a good way for students to give back to the community in which many of them live. "Terre Haute is home for many of our commuters," he said. "Regardless of their hometown, it gives commuter students an outlet to give back to the community, especially during a time where there are a lot of people in need." The Women's Club is grateful to have found a partner in Indiana State. "We rely on the generosity of the community," Thomas said. "I'm happy the students are giving so much of themselves to children in the community." Gant said there's a possibility the partnership with the Shoe Bus could become an annual service project. ‘It's a good fit," he said. "Our students like the idea of helping other students." For more information about the Shoe Bus or to donate to the project, send correspondence to the Terre Haute Women's Club, PO Box 3217, Terre Haute, Ind. 47804. Thanks to commuter students at Indiana State University, needy area schoolchildren will have socks to keep their feet warm during the upcoming cold winter months.